Interested in helping out a local K12 educator by sharing your expertise in GIS? Many Alaskan teachers have begun using ArcGIS Online for Organizations subscriptions in their classrooms, along with the Collector for ArcGIS app. Some of them are looking for a GeoMentor. This could mean having someone they could call or email once in a while with questions, someone who can publish editable feature services to their online accounts for data collection, someone to meet with to walk through project specifics, or someone to visit the classroom and share their knowledge of GIS with students. If you are open to the possibility of becoming a GeoMentor, please visit the K12 GIS Story Map, click on the GeoMentor section and hit the "Count Me In" map link. For more information on GIS in Alaska's K12 schools, contact Katie Kennedy at 907-474-6121 or via email at cmkennedy@alaska.edu. BDL Services are at Risk - Show Your Support! Alaska GIS users should be aware that widely popular web services developed in support of the SDMI, including the 'best data layer', or BDL, are at risk from lack of infrastructure maintenance and support. Last year the interactive site for discovering and downloading state imagery and elevation datasets, browse.alaskamapped.org, ceased to function when support for critical infrastructure was discontinued by Google. Without updates and maintenance to adhere to latest standards, the SDMI web services are also risk. How to help: Web service users are encouraged to share information on the use of these services and impact on agency workflows and missions so that informed decisions about if and how to support statewide web services can be made. Feedback can be provided through the survey link, which was designed as a tool to facilitate discussions on the use of SDMI web services, or via email to chris.hamilton@alaska.gov. The Alaska Geospatial Council currently has 6 State government agencies on the charter signed by the Governor, but is expected to invite additional non-State government members soon. Chris Hamilton will help facilitate feedback from these groups to the council in the interim. This topic is separate from geoportal, in that the web services being discussed involve massive volumes of data and can require significant oversight and personnel for effective data curation. Geoportals point to feeds supported by these large datasets, which are hosted on separate platforms designed to meet the robust requirements. The survey will be left open, but respondents are encouraged to submit feedback by COB October 29th for discussion at the upcoming Alaska Geospatial Council meeting on October 31st. GIS Day - November 21 - Get Involved! 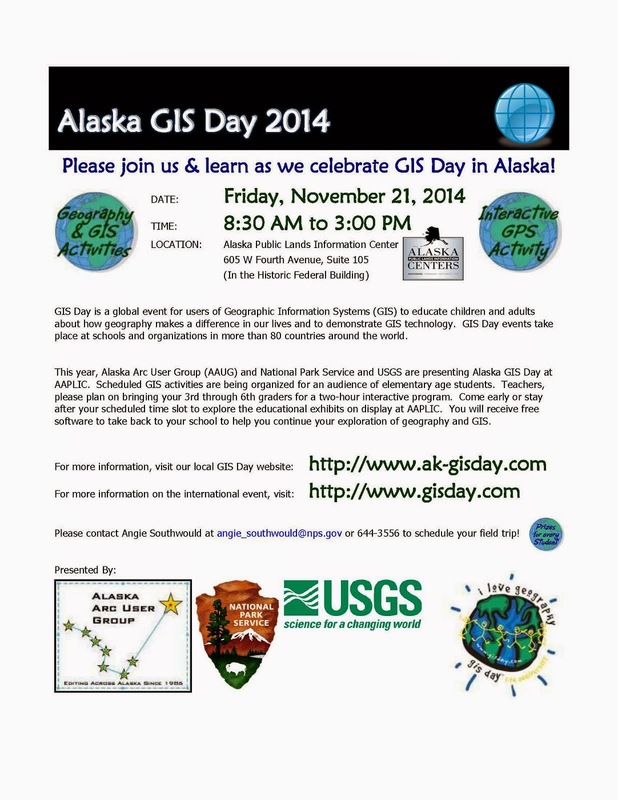 We are on track to celebrate GIS Day on Friday, November 21 at AAPLIC in downtown Anchorage! I am already receiving requests from teachers and I expect to soon have 150-200 excited students (grades 3-6) ready to join us for a two hour exploration of GIS and GPS. Our first time slot begins at 8:30 and our last time slot ends at 3:00. We've got a busy day planned and we really need volunteers to help make this event run smoothly. If you can spare the morning or afternoon or all day to join us and help out, please contact me at 644-3556 or via email at angie_southwould@nps.gov. Be sure to include when you're available and your preference for the areas in which you'd like to assist. We are also on the lookout for student-friendly goodies to fill our geocaches. Click here for more information on how you can get involved with our GIS Day event! Smithsonian-Mason School of Conservation (SMSC) at Smithsonian Conservation Biology Institute (SCBI) offers unique intensive residential conservation training courses hosted in our sustainably-built Academic Center in Front Royal, Virginia, USA. Limited scholarship funds may be available for international applicants and new reduced fees are now available to applicants from less-developed nations. Visit our website (http://SMConservation.gmu.edu) or email us at SCBItraining@si.edu for more details about each course, course costs, and graduate or continuing education credits earned. This project is multifaceted and will include a mix of oﬃce and ﬁeld work in the GIS technologies. Duties include assisting ﬁsheries and GIS staff in maintaining and updating spatial data, map production, as well as developing methods for legacy data integration and utilization of mobile GIS technologies. Responsibilities include the proﬁcient use of ArcMap, ArcPad, Model Builder, and other ESRI products, Trimble data collection devices and familiarity with ArcGIS Server, Esri’s Collector software and web feature services. The intern will also assist with database development as it pertains to data collection requirements and the testing of mobile computing solutions. Fieldwork will consist of 10% of the work and will generally involve day trips to road accessible sites for device testing. Oﬃce duties involve 90% of the work and include database maintenance, legacy data importation, spatial data creation and management, mobile GIS application troubleshooting, report preparation, training development, and other related duties as assigned. A degree or certiﬁcate in GIS or Spatial Analysis is required for this position. Training Provided: Training in a variety of subjects ranging from natural resource management to information technology would be available both formally and informally to the intern. To apply for this position, please complete and submit an application from the Online Job Announcement link above. For more information, contact Jeff Chen at 907-717-8414 or via email at jchen@thesca.org.